Wednesday: Sun-filled and quiet, with a slight warm-up. Highs near 30. Wednesday night: Clouds build in. Wind shifts to out of the north. Snow showers pick-up in the predawn hours. Thursday: Snow, heavy at times, impacts both commutes. White-out conditions likely. A foot of snow or more is possible for some; lower accumulations at the Cape & Islands. After a quiet start to the night, snow will spread from south to north predawn Thursday, quickly coating roads. By 9 a.m., winds start increasing markedly and whiteouts ensue, making travel nearly impossible through the day. Snow will start breaking up between 5 to 7 p.m. and depart around 11 p.m. Frigid temperatures return on Friday. Get ready for the first Blizzard of 2018. This storm won't be remembered for huge amounts of snow, but rather its multiple components. Expect damaging winds and moderate to major coastal flooding. Don't get me wrong, we still get quite a bit of snow. 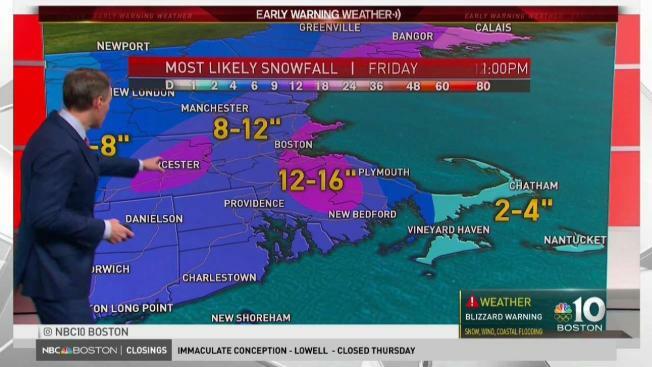 The last time Logan airport received 12 or more inches out of one storm? Feb. 15, 2015. The airport logged 13.0 inches. 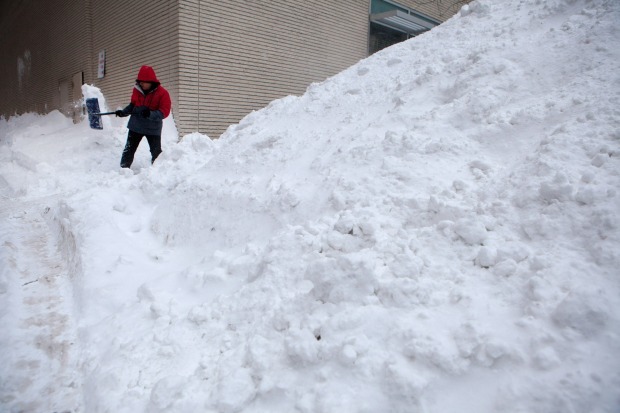 It was one of several major storms that winter – arguably the worst winter on record in Boston. Winds could rival what we saw during the pre-Halloween storm, which left people in the dark for more than a week. I'm not saying the power outages will be as widespread, however, the weight of the leaves on the trees could be equal to the weight of the snow on the trees. At the least, prepare of isolated to scattered power outages. Winds ramp up by dawn and they stay strong through Thursday evening. At the coast, they may gust as high as 75 mph. Away from the coast, gusts will likely climb to 40 or 50 mph. Strong winds and astronomically high tides will lead to moderate to major coastal flooding. If evacuations are ordered, listen to law enforcement officers. Chunks of ice being pushed by a 2-3 foot storm surge could cause structural damage at the coast. It's the early afternoon high tides we are most concerned about. Gusts from the north, then the northwest, will hit 50 to 60 mph along the coast and 45 mph inland, creating power outages, particularly where rain turns to pasty snow. Snow picks up in intensity during the morning community. The heaviest snow falls during banker's hours. We are expecting widespread amounts around a foot. Blowing snow and heavy snow will help drop visibilities to a quarter mile or less. The next storm is on the docket for early next week, with another chance at the end of the week in the exclusive Early Warning Weather 10-day forecast. Click here to download our free app.